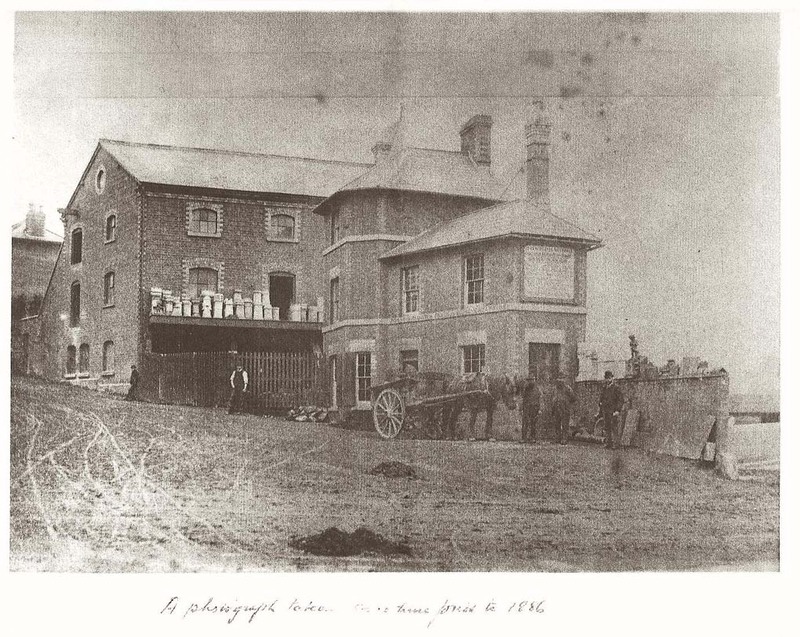 I am the great-great grandson of Joseph Wood who, with his half-brother Tom Rowe, founded the coal and then builders’ merchants Wood & Rowe that used to be in Stroud. We have discovered from our research that Tom Rowe was actually Joseph Wood’s half brother, their mother being Dinah Grime who married (another) Joseph Wood. He must have died young because she then married a John Rowe, then later William Mortimer. Joseph’s son, Miles Frederick Wood (Fred) was a near-life long member of the Hicks Beach Masonic Lodge and its secretary for 60 years. We have an object that used to be in the possession of my father that we found in his house when he died. 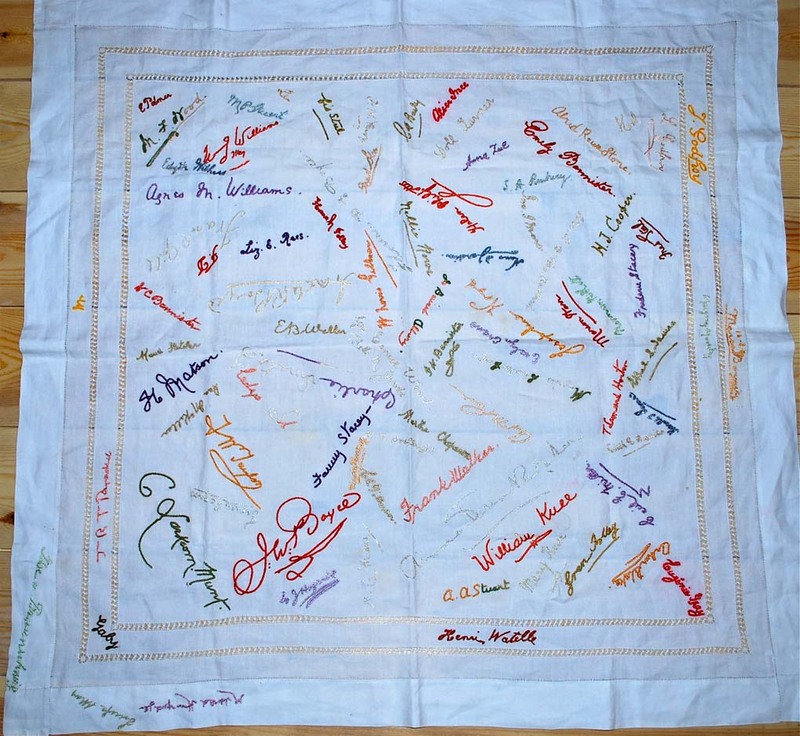 This is a small tablecloth, apparently signed by about 60 people at, we assume, some function. The signatures were later embroidered. There is a date which we think is 16-8-’97 but it is difficult to decipher. We recently took it to the Stroud Museum where some of the names were identified as local businessmen of around the end of the 19th century. Some names are clear, like M.F. Wood himself, other members of the family and names like Bannister, Boyce, Knee etc. We are trying to find out what the function may have been and wondered whether any of your members could throw any light on it. They may also find it of interest if there are still members of the families mentioned in Stroud. 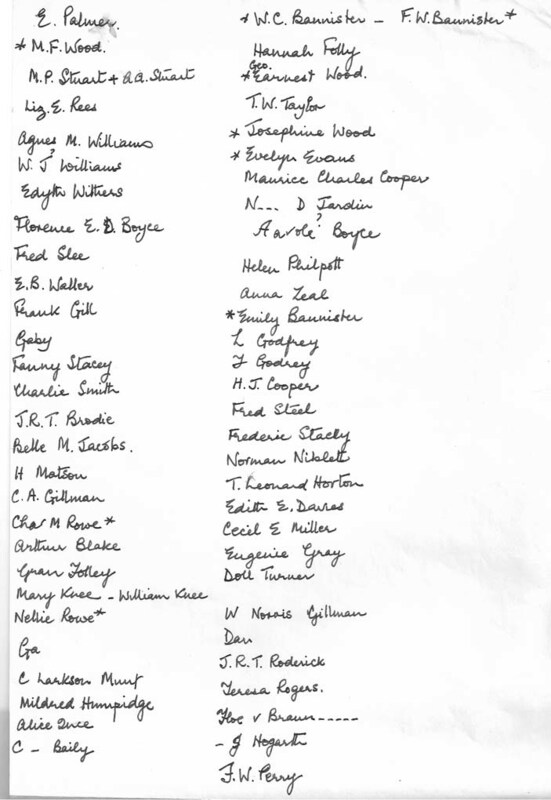 If you are interested I could send a photograph of the tablecloth and also a list of the (decipherable) names that was once transcribed by my father’s cousin. Howard Beard picked up the query at the time and, although he was able to add to Paul’s research, the tablecloth remained a mystery. On looking at the cloth again, I don’t think it would represent an actual Masonic event as there are several family members on it (apart from Fred) and also many women. Since my 2010 question I have found that my great-grandparents, i.e. Fred Wood and Eugenie, were married not in Wales at all, but Kingston-on-Thames, in 1896. As their first child (Vivienne) was born in 1899 [in Stroud], I think the cloth could be related to either their engagement or wedding – I tend to the first, as Eugenie’s father (Evan Evans) is not on the cloth. So it looks as though the tablecloth (if we have deciphered the date correctly) post-dates their wedding. Another possibility is it doesn’t record an event at all, but is a record of people that visited the (newlyweds) house. Apparently that was popular at the time, the lady of the house kept a tablecloth on a small table at the entrance – visitors signed it and the signatures were later embroidered on. Of course, many of the people on it could be Masons if they knew Fred. We know from visiting Stroud Library that several of the names are of prominent trades people of the times, though none of the names seem to be the ‘top level’ of Stroud society, which would fit with Fred running a coal merchants. What is curious is that his wife is not on the cloth, either as Eugenie Wood or Eugenie Evans. We know she was in Stroud in 1891 and have no reason to believe she would not be in 1897 – my conclusion is that Eugenie’s name is not on the cloth as it was presented to her.